I imagine Moses would have wanted to escape Pharaoh and his soldiers as soon as possible, so I have set this scene just after dawn. The rising sun is in the east, which is behind the viewer and to the right. Low shadows from the hills Moses and the camel train are walking up are falling away onto the Nile plain behind them. Sunlight can be seen in the distant landscape, particularly on the city of Akhetaten, on the banks of the Nile river. Strong sunlight and shadow can be seen on the foreground figures, camels and rocks. 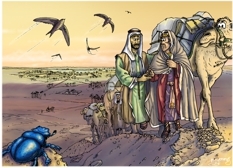 Moses, paying a man to travel with him and his camel train to Midian. Various men and camels. The only difference between the two scenes is the colour of the sky. I thought I would draw a couple of Bible Cartoons depicting Moses hurriedly leaving Egypt. Verse 15 informs us that Pharaoh tried to kill Moses, which is obviously the cause for Moses’ hurried departure from that land! 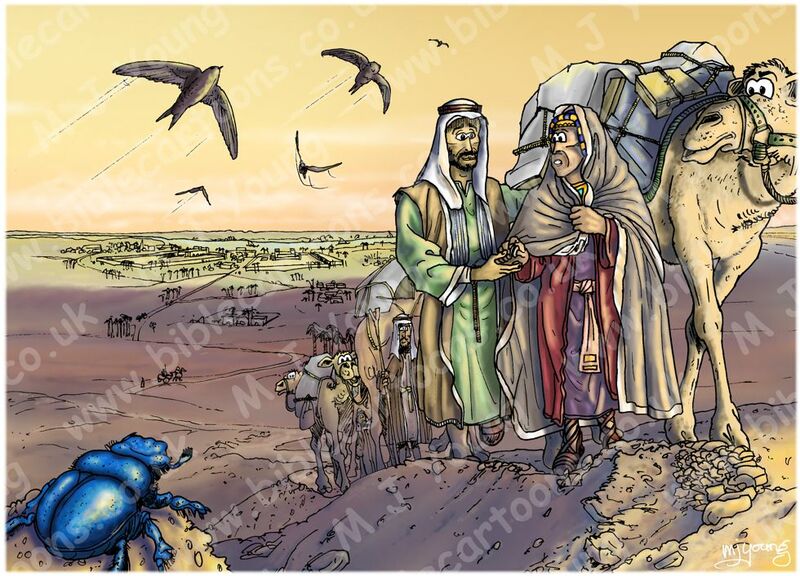 You can see Moses still in his Egyptian robes, walking alongside men and camels heading out of Egypt. Moses is paying a man to let him travel with the camel train. 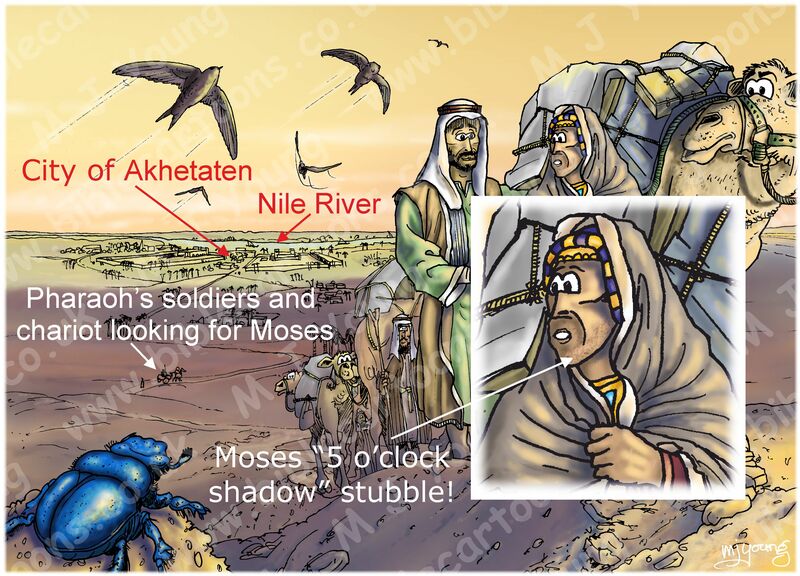 Notice that I have drawn Moses covered up with a drab looking blanket, in an attempt to avoid Pharaoh’s soldiers, who are looking for him. You may just be able to make out a chariot and spear-carrying soldiers in the middle distance, behind the camel train, heading back towards the city. That is my way of visually depicting the fact that Moses has managed to elude Pharaoh’s soldiers and make good his escape! If you look at previous scenes of the early life of Moses, I have drawn him without a beard. This represents his youth, and the culture of the Egyptians at the time. Although Moses was about 40 years old when he left Egypt, and therefore quite capable of growing a beard, I have drawn him without one. If you look carefully at my depiction of Moses in this scene, you may just be able to make out that I have drawn him with “5 o’clock shadow” or the first signs of stubble on his chin. I reason that Moses wanted to disguise himself from Pharaoh’s guards and soldiers, who we know wanted to kill him, and so allowing his beard to grow might provide Moses with that disguise. Incidentally, I have drawn Moses with a blanket over his Egyptian clothes, as part of his hastily contrived disguise! In the scenes I have already drawn showing Moses in Midian (ie the set of Bible Cartoons entitled “Exodus 03-04 – Burning Bush”) I have drawn Moses with a full beard. In these scenes he has his characteristic Hebrew inner and outer blue robes. The most noticeable animal in this scene is a bright blue Dung beetle (Scarabaeus sacer) in the left foreground. The ancient Egyptians used symbols in their art and religion. The common scarab beetle, found all over ancient Egypt, was one such venerated animal, symbolizing the restoration of life. The birds in this scene are Common swift (Apus apus), which I thought would be an appropriate metaphor representing Moses’ rapid exit from Egypt! The other animals are dromedaries, or one-humped camels (Camelus dromedarius), which are found throughout the Middle east and the horn of Africa. They are used to great effect as beasts of burden, and have served mankind for thousands of years. When and where did Moses live in Egypt? It is fascinating reading about scholars’ attempts to uncover the facts regarding this era. Apparently there are 2 schools of though about when Moses lived in Egypt. Some say it was the first half of the 13th Century BC. Others propose the 15th Centruy BC; the author of the article above favours the latter. According to mr. Hansen, Hatshepsut of Dynasty 18 may very well have been “Pharaoh’s daughter”, mentioned in Exodus 2:5. Then it was a quick look to find the dates for Dynasty 18, which was c. 1353 BC – c. 1332 BC. So if you believe the evidence supports the Dynasty 18 date, then we have our date of WHEN Moses lived in Egypt. This informed me that Akhetaten was the capital city of Dynasty 18. 04) I used Google Earth to find Akhetaten, which is now called Tell el Amarna in Egypt. I found a variety of photo images from the surrounding area that helped me to design this scene of Moses leaving his home city in Egypt. Google Earth helped me to see that the city of Akhetaten was built near the Nile River, as many of the capital cities of Egypt were. Indeed, much of the population lived very close to that river. In my picture you can see the city near the horizon, on the left. The Nile (with several boats on it) can be seen just behind the city as a turquoise coloured strip. I also discovered that there are hills to the east of Akhetaten, which is what you can see Moses and the camel train walking up. They strong sunlight from the rising dawn sun is just catching the edges of the figures and camels, as they approach the summit of the first line of hills. “No boundaries can now be assigned to “the land of Midian.” It included territory on the West as well as on the East of the Gulf of `Aqaba (Exodus 4:19). It lay between Edom and Paran (1 Kings 11:18). In the time of the Judges their district seems to have extended northward to the East of Gilead (Judges 8:10). As with many places named in the Bible, the exact location of the “land of Midian” seems to be uncertain. Over time the boundaries of the “land of Midian” may well have been re-drawn (if they ever were formalised by a map!) especially since the area of the Middle East has undergone many major and minor political boundary changes over the long course of its history. We know from Exodus 3:1 that Moses was tending his father-in-law Jethro’s sheep near Herob, the mountain of God (aka Mt. Sinai). We can reason that Moses went from Egypt to the “land of Midian”, and that this place was either 01) part of the northwest Arabian Peninsula, on the east shore of the Gulf of Aqaba on the Red Sea, or else 02) on the eastern edge of the Sinai Peninsula. Indeed, it is entirely possible that Moses went to the first, then moved around with the flocks, and came to the mountain of God in the 2nd, at a later date. This is quite possible since we know ancient shepherds moved their flocks and herds around constantly looking for better pastures. 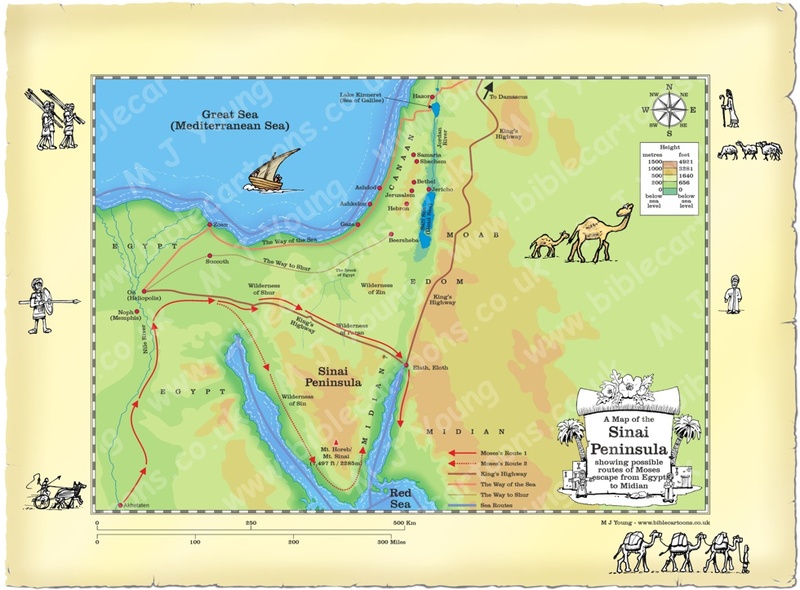 The map below shows 2 possible routes Moses may have taken out of Egypt and towards the land of Midian.